Fifteen years ago, Heather Anderson came up with a crazy idea–and on November 8 it came true. 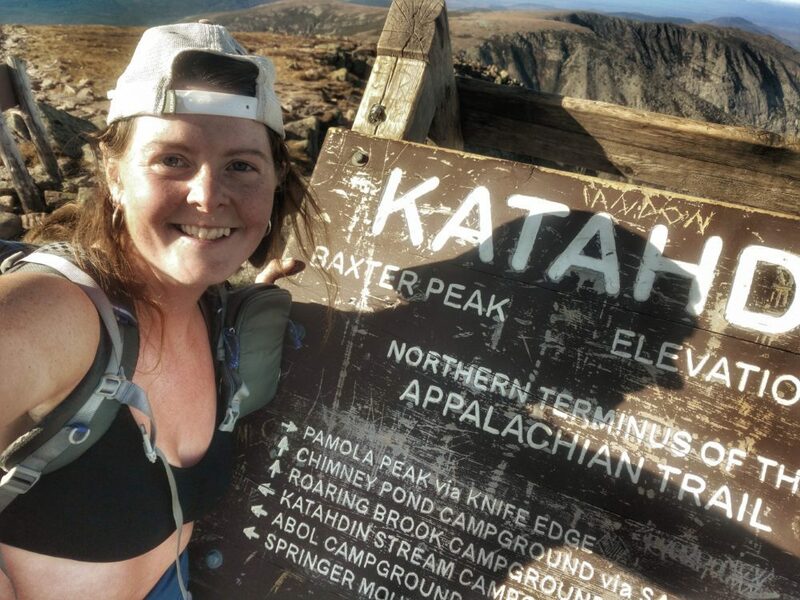 She just completed over 11,265K (7,000 miles) of hiking in eight months, hiking the Appalachian Trail (3,380K+), Pacific Crest Trail (4,184K+), and Continental Divide Trail (4,828K+) in one calendar year. Not only is she the first woman to complete the Triple Crown of thru hikes in one year, she is also the first woman to have completed each trail three times (Triple Triple Crowner). She has the self-supported female Fastest Known Time (FKT) on the Appalachian Trail (AT) and Arizona Trail. 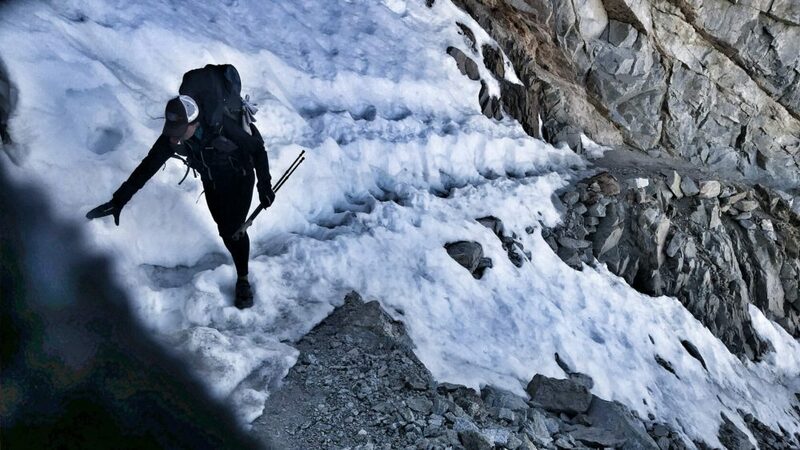 Also the overall self-supported FKT on the Pacific Crest Trail (PCT). Canadian Running was lucky to speak with the accomplished adventurer less than 26 hours after she stepped off the trail. In 2003, Heather (or Anish) read an article about Brian Robinson, the first person to complete the Triple Crown of thru hikes in a calendar year. “Fascinated by the idea, I’ve wanted to do it ever since.” She completed her first thru hike on the AT that year, and kept going. Over fifteen years she has hiked more than 32,187K, completing 10 thru hikes in the United States. 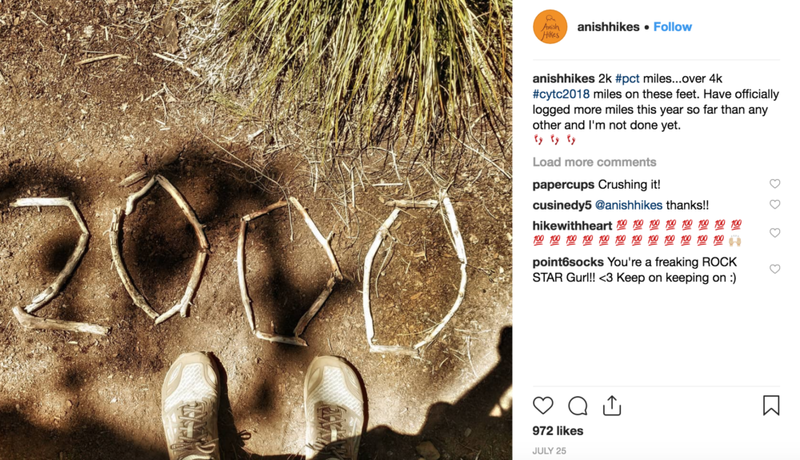 The 50th anniversary of the National Trails Act in 2018 “seemed like the year” for her Triple Crown pursuit. On March 1 she headed to Springer Mountain to start the Appalachian trail for the third time, beginning her longest adventure yet. Canadian Running: Congratulations! After eight months of hiking, how does your body feel? CR: Mentally, are you able to wrap your head around what just happened? HA: Not yet. It’ll take a while. I haven’t had a chance to fully absorb that I’m fully done. The mental is the hardest part of the recovery. The physical just happens. The mental can play a lot of tricks on you. CR: What has been your experience with the mental recovery from a thru hike? HA: Mental recovery from a thru hike is interesting because most hikers experience this post-hike depression. Different from an ultra [running event], but not entirely. You work toward this thing for months on end, and then you’re done. When you’re on a thru hike, all you do is walk for months on end and then you’re there. Then there is this huge let down. You have to return to this life you put on hold. it’s almost reverse culture shock–going to the bathroom indoors, showering regularly, sleeping in a bed. All these things you didn’t do for months, and you know it’s normal. But it doesn’t feel normal. It can be quite a tailspin. CR: What is the “real life” you are returning to? HA: My fiancé [Adam] and I have to plan a wedding. We have very loose wedding plans. But we decided we are getting married next year. CR: Were you able to hike parts with Adam over the last eight months? HA: He started [and finished] the PCT with me on August 16. Then he met me by car as often as he could on the Continental Divide Trail (CDT). Usually every couple of days. Some sections he could see me a lot, and some sections the car couldn’t get up the road. Then we met up in Denver. CR: It’s like a mobile aid station! CR: Were there moments when you considered ending your hike early? HA: There were a lot of moments where I thought why am I doing this? There’s always a rough day where you think you don’t want to do this again. Usually it didn’t last more than a day or two. I think when I didn’t want to finish, I was near the end in Colorado on the CDT. I had to walk on the road around the trail. But I only had 200 miles to the finish. That was the time it seemed like a job to put in my miles and put in my steps to finish. Once I got to New Mexico, I was back on trail and it was fine. They’re mostly weather related. Nobody wants to be out in crappy weather all day everyday. Near the end where it was starting to be winter. CR: What was the worst weather? HA: Worst weather was the on AT in the Spring [at the start]. I got hit by three different winter storms all in a row. One time I stayed in town cause it snowed two feet (61cm) on the trail overnight. Then I hiked in two other storms. There were three storms of close proximity that dumped a big amount of rain and snow on me. CR: Any other crazy or scary moments that stick out? (Pun intended). HA: Some of the winter storms I almost had hypothermia. [Another time] I was chased by a scary dog and had to hit it with my trekking pole so it wouldn’t bite me. CR: Was it on the trail with the owner? HA: No, this was in a town from someone’s house. It ran across the highway at me. CR: So the scariest moment was off the trail, or in “civilization.” How often would you go into a town for rest days? HA: I keep my rest days to my travel between trails. I did take a few bad-weather rest days on the AT. And took a couple of rest days on the PCT, staying with friends. It was just convenient. We stayed with friends in Bend. Had a nice rest, and ate a lot of food. I didn’t plan my rest days. I felt like when I really needed it, I took a day off. CR: How many rest days in total over eight months? HA: 15 to maybe 20 rest days in total. Sometimes there would be four days to travel between this trail and this trail. Although travel is never that restful. CR: You are well known in the trail running and thru hiking community. Were you recognized on the trail? HA: I got recognized a decent amount. Mostly on the PCT probably. Thirty per cent of the time I got recognized. CR: Where does your trail name, Anish come from? HA: My first thru hike, on the AT, I named myself Anishinaabe. My great great grandmother was Anishinaabe, Native Americans from the upper mid west of United States and Canada. Everybody started calling me Anish. That’s what my trail name became. CR: Considering this was your third time completing the AT, PCT, and CDT, were there memories from previous years on the trails? HA: I was constantly reminiscing about all previous experiences on the trail. There was a lot of comparison. The trails have all changed. The biggest change was CDT from 2006 (the first time I hiked it) to now. It wasn’t really a physical trail on the ground in 2006. There were a lot of parts that were cross-country or incomplete, and largely unmarked. And now it’s completely marked the entire way. There’s a GPS app for it. It’s gone from very nascent to a “concrete” trail now. It definitely exists. That was the biggest change. CR: Did you notice differences in the number of people on the trail? HA: All of the trails have more people on them now. The PCT has had exponential growth in the last few years. The CDT has had growth as well, just not as noticeable. The first time I hiked the CDT there were 50 people in total. This year there were 400. The PCT this year issued 4,000 permits. AT numbers have increased, but it had always had a lot of people on it. The nature of the trail (AT) helps hide the number of people. [The AT is] largely forested, so it’s not like you can see people miles ahead, like you can on the PCT. Their shelter system is mostly on side trails, so you don’t see a million tents on the trail. You don’t feel the numbers as much. CR: Do you think social media contributes to the increase in popularity? Or are there other factors? HA: Social media has impacted it and made certain things more popular. I don’t know if it’s a positive or negative force yet. That remains to be seen. There are definitely more people on the trails because of social media. I don’t know if it’s just social media or because it’s a trend. [The AT, PCT, and CDT have been] gaining popularity since the early 2000s. Long before we had social media. I think that’s helped accelerate popularity and growth of certain trails. But I don’t think it’s the only reason the trails have more people on them. CR: When were you alone for the longest stretch of time? HA: I had a journey that was very solitary [on the AT] because I was there before anyone else was this year. That was a completely different and bizarre experience. That’s cool to feel like I had the whole AT to myself. CR: How did you eat for eight months? HA: I made boxes for first few months, then I bought food as I went. At one time, I only wanted peanut M&Ms and then I never wanted that again. Binge foods, and then you’re sick of it. All I wanted to do at the end was eat salad. There were a couple of months where nothing sounded good. Eventually you get burned out of everything and just try to keep the calorie intake adequate. There was a time I bought a bunch of applesauce. Sort of random. I just tried to trust my body’s cravings. CR: Now that you’re adjusting to “real life” again, when does your book come out? HA: In the spring. It’s been many years in the process. I’d write and then I’d stop. Finally got serious about it last year when I found a publisher. I was planning my thru hike and finishing a book in three months. I was still mailing things to the publisher on the drive to George to start my hike. CR: Since you have barely started the recovery process, I won’t ask if you have any more adventure ideas on the horizon. CR: That makes complete sense! Only four other men in history have just accomplished what you did. You have a wedding and book launch adventure though. Where are you headed now? HA: Eastern New Mexico. Right now we are driving 1,700 miles (2,735K) to visit family. CR: Congratulations again, I hope it’s a restful ultra drive with lots of fuel. Heather Anderson has the overall self-supported FKT on the PCT (2013) in 60 days, 17 hours, and 12 minutes. She also has the female self-supported FKT on the AT (2015) in 54 days, 7 hours, and 48 minutes. She has the first female record on the Arizona Trail (2016) in 19 days, 17 hours, and 9 minutes. Heather is also an ultramarathon runner and completed six 100 mile races and dozens of 50K and 50 mile events. She has toed the line at the Barkley Marathons four times. Her book Thirst: 2,600 miles to home comes out March 1, 2019. You can pre order here.